Johnny Allen piloted the Triumph-powered Texas Ceegar to an outright motorcycle land speed record of 214.40 mph on the Bonneville Salt Flats in 1956. This year, Matt Markstaller hopes to return the record to Triumph and maybe become the first to top 400 mph on two wheels. He’s brought a 25.5-foot-long streamliner powered by two destroked, turbocharged Rocket III engines producing 1,000 horsepower to Bonneville, and flown in TT ace and British TV personality Guy Martin to pilot it. Editor's note: Teams will try top-speed runs beginning Thursday, conditions permitting. The current motorcycle record is 376.363 mph, set by Rocky Robinson in 2010 in the Top Oil-Ack Attack streamliner. The 60th anniversary of that first record makes this a perfect year, from the perspective of Triumph’s marketing department. But Markstaller did not purposely time it that way. 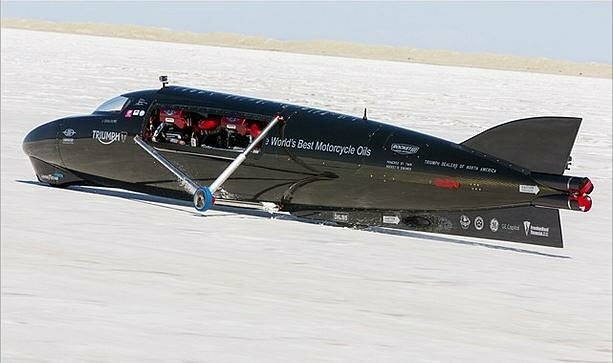 He had his streamliner ready for a record attempt over two years ago, but there was no serious racing on the salt flats at all in 2014 or 2015, because the salt was too soft for good traction and too thin to support the vehicles. Since the U.S. Bureau of Land Management began studying the situation in the early 1960s, the area of the salt flat has shrunk by about one percent per year. More serious has been the decrease in the thickness of the salt crust – from two feet to two inches! That makes it harder and harder to lay out the course of more than 10 miles that is needed for a serious attempt at an outright record. Most racers blame the decrease in salt quantity and quality on hydraulic mining that takes place on the edges of the protected area. The mining operations extract minerals from brine gathered from ditches on the edge of the flats, and return less-salty water to the aquifer. Racers feel that the salt’s being dissolved from below, and that human activity’s to blame. Over the last few years, the miners have agreed to attempt to mitigate damage by pumping concentrated brine back out onto the salt surface during the wet season. (The flats are actually a shallow lake in the winter and spring.) The consensus is that the salt-replacement plan has not worked. There are plenty of experts who dispute the claim that mining’s the problem; it’s possible that climate change, or some other natural phenomenon’s to blame. The Texas Ceegar set the outright motorcycle land speed record in 1956. Two years later, Triumph unveiled a new model, the Bonneville, which commemorated that record. Triumph photo. People who’ve been racing at Bonneville for decades tell me that 2016’s salt is the best it’s been in a while — though it’s nowhere near as good as it was when Johnny Allen set his famous record. The trend is definitely not good. Many land speed racers feel the days of racing on the Bonneville Salt Flats are numbered. There may never be a better chance at Bonneville to break the 400 mph barrier on two wheels.